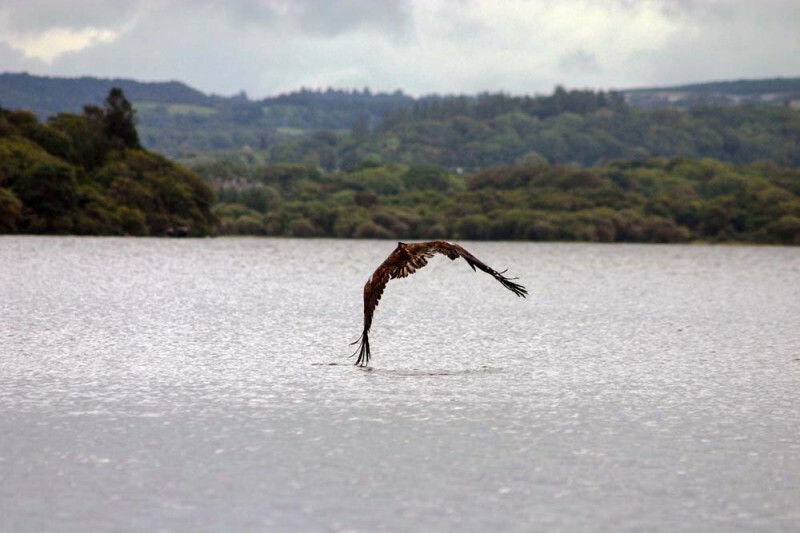 The Lake Hotel is a great place for Birdwatching in Killarney one of the oldest and one of the most attractively located hotels in the Killarney region, if not in Kerry. Situated in 35 acres of it’s own wooded grounds, the hotel property abuts on to the 10,000 hectare Killarney National Park. 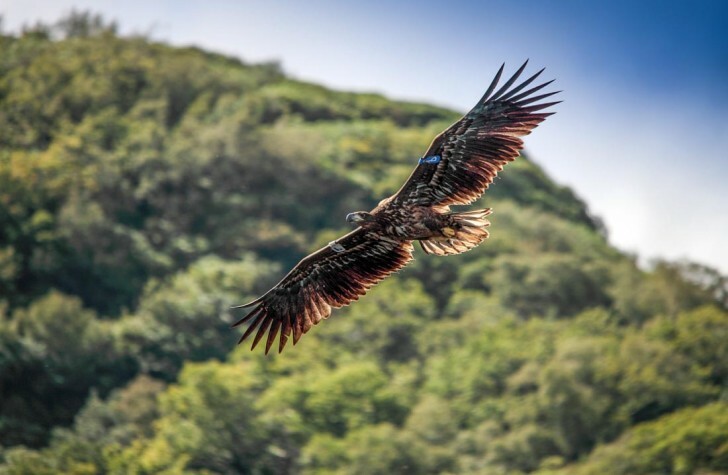 The hotel is an ideal location for visiting birdwatchers wishing to explore the region. In front of the hotel, the glistening waters of Lough Leane reflect the images of Torc, Eagle’s Nest and Purple mountains which rise to nearly 1,000 metres. The largest of Killarney’s three lakes, Lough Leane overlies limestone on it’s northern and eastern shores and sandstone on it’s southern and western shores. This geological divide has created a wide variety of habitats in and around the lakes, from wooded mountain slopes and islands to shallow reed-filled bays. These bays in particular attract a wide range of wildfowl (23 species) and wader (17 species). Red breasted Merganser, Tufted duck and Teal all breed, while rarities such as Garganey, Goosander, Green-winged Teal and Ring.necked Duck have occurred. Woodcock, Common Sandpipers and Snipe are also common breeding birds, while Jack Snipe are frequent winter visitors. Castlelough Bay is located at the eastern end of Lough Leane, and has a number of small reedbeds located around it’s shores. The largest of these lies in front of the Lake Hotel, and is best viewed from the raised pier nearby. From here one can get excellent views of Great – crested Grebes, Sedge Warblers, Tufted Duck and Coot, with a good possibility of seeing the elusive Water Rail. The reedbeds attract a good Swallow roost in the autumn. Red deer are often seen in the woods at the edge of the reedbeds, and there is a good chance of seeing otters here in the morning. Within a few kilometres can be found the most diverse range of woodlands in Ireland. The nearby Muckross peninsula contains Ireland’s only Yew wood, covering 28 hectares. The mountain slopes nearby hold woods of Sessile Oak and Beech, as well as mature stands of Scots Pine, Douglas Fir, Western Hemlock and other conifers. There is also an interesting avian fauna, including Long-eared Owl, Jay, Sparrowhawk, Siskin and Crossbills. Wood Warblers and Common Redstarts are occasional. The shores around Ross Castle are fringed by extensive Alder woods where Blackcap and other warblers breed, and which in winter attract large flocks of Siskins, Redpolls and other finches, as well as good numbers of wintering Chiffchaffs. Dipper and Kingfishers occur on nearby rivers, and a small flock of Greenland White-fronted Geese winter on bogs in the National Park. 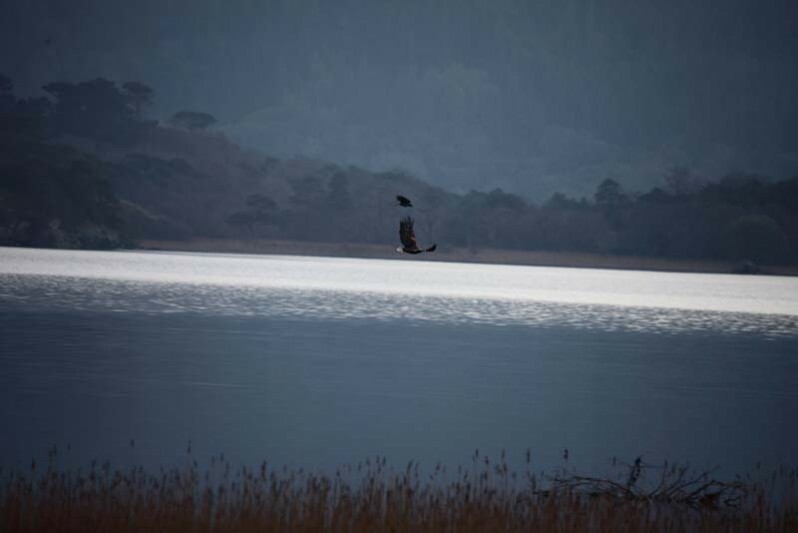 Twenty kilometres west of Killarney the estuary of the rivers Laune and Maine forms a rich feeding ground for many birds. The mouth of the estuary is protected by three spits, Cromane and Rossbeigh on the south shore and Inch spit on the north shore. This whole area, Castlemaine Harbour, provides a wonderful day’s birding against a spectacular backdrop of high mountains. When the tide drops off, large areas of mudflats are exposed behind Inch and Rossbeigh. In autumn, this area is best visited on the incoming tide, when the wildfowl and waders are pushed upshore and thus easier to view. Large numbers of Wigeon, Pale-bellied Brent, Shelduck, Oystercatchers, Dunlin and Knot congregate behind Inch with lesser numbers of Pintail, Teal and Bar-tailed Godwits. American Wigeon have been seen on a few occasions, but because of a low population density the area is very under-watched and a lot of rarities are probably missed. On the south shore, Cromane Point, a shingle spit holds up to 200 Turnstones and has been visited by little Egrets, Short-eared Owls and Black Redstarts. Further Southwest, check Rossbeigh for Brent geese and Chough, over 30 of which frequent the sand dunes outside the breeding season. Offshore, one of Ireland’s largest flocks of Common Scoter winter, numbering up to 7,000 birds, often being accompanied by Velvet and Surf Scoters. Up to 250 Red-throated divers also winter here. Thirty kilometres north-west of Killarney lies Tralee Bay. This is one of the best birding areas in Ireland and is readily accessible along both it’s northern and southern shores. Just outside Tralee, on the N68 road to Blennerville, the estuary of the river Lee starts. The nearby saltmarsh is an important roosting site for waders, including many thousands of Lapwings which often provide spectacular aerial displays. Curlew Sandpipers, Ruff and Spotted Redshank are regular in this area, and every year rarities such as Greater and Lesser Yellowlegs, Sociable Plover and Avocet occur. Travelling further west towards Castlegregory brings you to Brandon Bay, one of the best Throughout the winter months the bay holds good numbers of scarcer species such as Slavonian, Black-necked and Red-necked grebes, as well as Great-northern and Red-throated Divers. 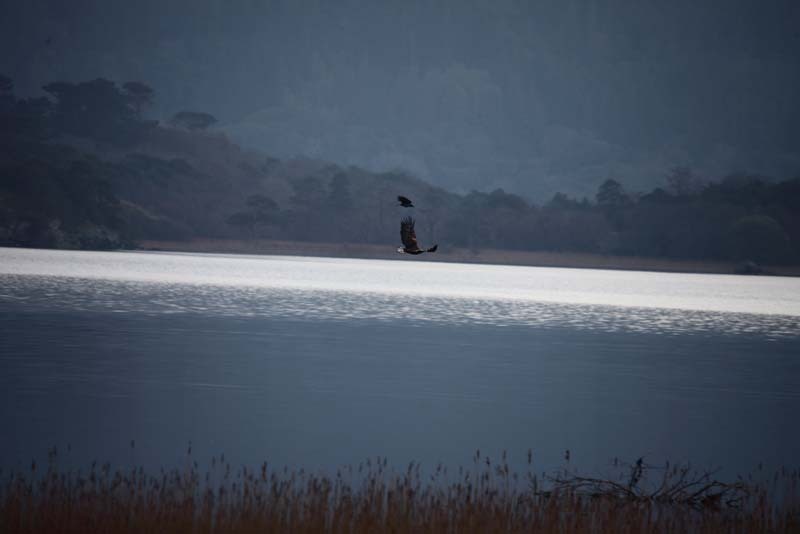 On your way, stop in at Lough Gill, an important site for wintering swans and duck such as Scaup (1200+), Shoveller and Gadwall. Greater Flamingo was one of the many rarities which turned up here recently. Turnstones and Purple Sandpipers over winter at nearby Rough Point. On the western-most tip of the Dingle Peninsula, the wooded gardens and glens at Dunquin have been attracting interesting sites for grebes, divers and migrant seabirds, Strong north-west winds in autumn will funnel birds into this bay and Brandon point is a popular seawatching point. Great, Arctic and Pomarine skuas are frequent and Long-tailed skuas turn up annually. Large numbers of Cory’s and Sooty Shearwater, Grey Phalaropes and Sabines Gulls have also American vagrants such as Red-eyed Vireos and the locality is well worth a visit during the autumn. North of Tralee one should stop in at Barrow Harbour and Carrahane Strand, which attract up to 1,000 Pale-bellied Brent Geese and 10,000 Golden Plover. Further north, just outside the sleepy village of Ballyheigue lies Akeragh Lough, a Mecca for European and American rarities. Lying behind the sand dune system of Banna Strand, this lagoon type lake has a good fringe of reedbeds and mudflats, through which a river flows to the sea at the nearby Black Rock, another site well worth checking. The list of rarities which gave been attracted to this relatively small site is staggering Pectoral and Buff-breasted Sandpipers, Red-necked Grey and Wilson’s Phalarope, Black and White-winged Black Tern, Forster’s Tern and Laughing Gull, Spotted Crake, White-rumped and Semi-palmated Sandpipers the list is endless. It is a site worth visiting at almost any time of year. Birds • Birdwatching • wildlife killarney.